A common dark green leafy vegetable with a mild grassy taste. Spinach is native to west Asia and is thought to have first been cultivated in ancient Persia. From there, it was brought to China and Sicily and spread throughout the Mediterranean. This dark, leafy green has an extremely high water content and, when it's picked young, is tender enough to melt in the saute pan. The extent of spinach's prowess may have been exaggerated; there's an urban legend that in the original findings of spinach iron content, a decimal was misplaced, leading doctors, diners, and television producers to believe that spinach was at least 10x more nutritious than it truly is. To add insult ot injury, spinach contains high levels of oxalate which inhibits the body's ability to absorb iron. 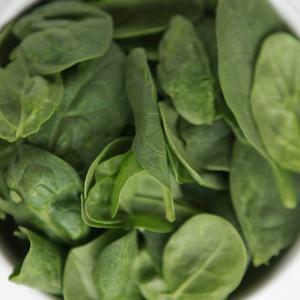 However, pairing spinach with foods rich in Vitamin C (such as peppers or lemons) helps counteract oxalate. Spinach can be eaten cooked or raw: it's the base for spring and summer salads, strengthens soups, loves pastas, and even has its own culinary terminology. To "florentine" a dish is to add spinach and bake it. However you choose to cook with spinach, you can be sure that it's a quick way to add delicious nutrition to any dish.